Connected to the gas pipe outlet (3/8"BSP) on your regulator a Flowmeter greatly increases the accuracy of gas flow control. Available in 2 flow ranges, 0-14 LPM for TIG and lighter duty MIG welding, or 0-25 LPM for heavier duty welding applications requiring a higher gas flow rate. 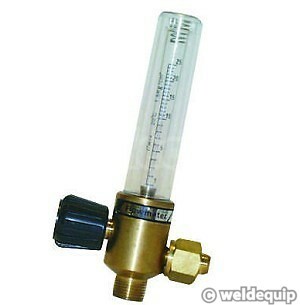 NOTE: Flowmeters are designed to be connected to industrial type gas regulators with a threaded outlet (3/8" BSP) and will NOT fit disposable canister type regulators or the more basic type refillable gas cylinder regulators without a threaded outlet, ie.where the gas pipe just pushes on to a brass 'tail' on the bottom/side of the regulator.